Of course, it still does (to a small extent), though the gap between the equivalent HP or Dell is now vanishingly small. Apple now trades on the quality of design and service – the components are the same as everyone else’s. 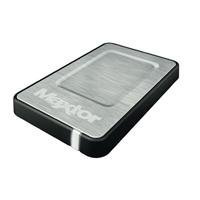 So what about other parts of the electronics market, such as external hard drives? 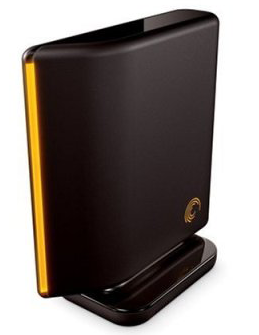 What differentiates a name brand from the cheap Far East enclosures?I took a look at two drives – the desktop-based 1 terabyte Seagate FreeAgent Pro, and the Maxtor 250 gigabyte One Touch Mini portable drive. Both are actually manufactured by Seagate (due to that corporate consolidation I mentioned earlier!). The Freeagent Pro is a well-designed piece of kit. Aesthetics are in the eye of the beholder, of course, but I actually love the look of it over a standard Aluminum box. It sits vertically on a flat base, and the enclosure has a tapered design rather than being a rectangular shape. The entire unit is finished in deep brown burnished metallic finish, with an illuminated orange stripe down the middle that pulses with drive access. I found the whole thing pleasingly “retro modern”, and a pleasure to have it sat on my desk. It was beautifully packaged as well, and comes with comprehensive instruction manuals and cables. The base has a touch-sensitive power switch that works just like the one on the old Apple cube. The drive ships with interchangeable modules for the base, offering Firewire, USB or eSATA connectors. I use it with Firewire on my MacBook, and it works flawlessly – and having a 1 terabyte Time Machine volume makes a lot of sense, as you can get a huge amount of historical backup with that large data space. The smaller Maxtor One Touch Mini was no less satisfying. With this one, a brushed aluminum chassis is used, but again a scooped design, non rectangular swoops and angles and a sturdy rubber bumper belt add interest and style, The drive is also absolutely tiny, has a side-mounted mini-USB port and ships with a quality double-headed USB cable that ensures the drive can get supplementary power if needed. A white LED light on the front pulses with drive access, and also can be used as a button that can be programmed via a utility to kick off backups on demand if required. Again, like the FreeAgent Pro, the Maxtor exudes quality and has worked much more reliably for me than any third-party enclosure I have ever used before (I have a cupboard full of failed Far Eastern kit sourced from eBay!). The empty enclosure still has a place in my tech armoury – if I upgrade an internal drive, the left over device needs to be put somewhere, after all. But, having used these two drive I am firmly of the opinion if an external drive is needed, going with a quality brand can pay dividends – particularly with the massive 5-year warranty you get with these devices on top of the quality build and design – a feature that tells you all you need to know about how long these disks will protect your data. We rarely give out a full five out of five for device reviews at MyMac, but for these drives I cannot deduct for any failings in the design, execution or pricing. As such, I unequivocally recommend them.